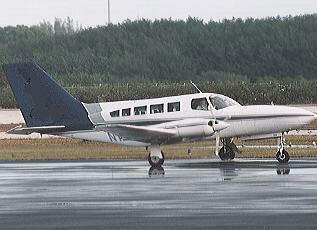 August 10, 2010 - The FAA has issued a Special Airworthiness Information Bulletin alert to owners and operators of the Cessna 402C airplanes of an airworthiness concern, specifically a reminder of the meaning of the “HYD PRESS” indication, and what may happen if this indication is not addressed. Six minutes after takeoff from a busy airport, a pilot reported smoke in the cockpit and declared an emergency. The aircraft landed without incident and all passengers and crew deplaned successfully. Maintenance determined that the hydraulic pressure did not relieve due to the nose gear not fully retracting. The nose strut did not extend completely, which prevented the nose gear from going in the up and locked position. This caused the hydraulic system to remain pressurized, which caused the fluid to heat up enough to melt the hydraulic reservoir sight tube. The hot hydraulic fluid then spilled out into the nose baggage compartment, releasing fumes into the cockpit and causing the perceived smoke. The Model 402C uses a hydraulically actuated landing gear system. When the landing gear is locked Up or Down, the hydraulic fluid is continually circulated through the system by the engine driven hydraulic pumps at a nominal pressure up to 50 psi. When the gear is selected from one position to another, the pressure varies but can reach as high as 1750 psi. When the system is pressurized above 150-175 psi, a pressure switch in the system activates an annunciator light (“HYD PRESS”). This light indicates that hydraulic pressure is flowing to the landing gear system. Any time the landing gear is in transit, the HYD PRESS annunciator should be illuminated. Although the FAA was unable to verify this, the HYD PRESS light in the above incident should have been illuminated starting at the time when the pilot selected gear Up, and should have remained illuminated for an extended time because the nose gear did not fully retract. 1. To make it easier for pilots to find the correct procedures, the procedures for “Hyd Pressure Light Illuminated After Gear Cycle” were moved from Landing Gear Emergency Procedures to Hydraulic System Emergency Procedures (this new section was created by the TR). 2. A Caution statement was added to the Amplified Procedures to emphasize that if the hydraulic system remains pressurized for an extended period of time, the sight tube could rupture. (Previously, the POH stated without a Caution statement that damage to the system was possible). 3. The Emergency Procedures, both the Abbreviated and the Amplified procedures, for “Hyd Pressure Light Illuminated After Gear Cycle” were enclosed in a box, making them immediate action items that are to be committed to the pilot’s memory. This point is especially important because this issue is most likely to occur shortly after takeoff, when the pilot is busy. If this were to occur, the pilot should not have to look through the POH in an attempt to find the correct procedure to address the indication; the pilot should already understand the issue and know how to resolve it. 2. When the HYD PRESS light remains illuminated for an extended time (longer than the normal landing gear cycle time), complete the procedures for “Hyd Pressure Light Illuminated After Gear Cycle” that they previously committed to memory. Please see the TRs to the POH for these procedures. Delaying completion of the procedures could result in damage to the hydraulic system and smoke/vapors in the cockpit. The Cessna 402 has proven to be a very dependable aircraft over the years which, along with its range and passenger capacity have made it a popular choice for many small regional airlines worldwide. The 402 are generally utilized on short, thin routes to hubs were passengers can connect to higher density routes. The largest operator of the type is Cape Air, which currently has a fleet of "over 50 402s" operating in the Caribbean and United States.